This film is an investigative documentary revealing how the Israeli military occupation in Palestine has become a business rather than a burden. Since 9/11, the Israeli arms industries are doing bigger business than ever before. Large Israeli companies develop and test the vessels of future warfare, which is then sold worldwide by private Israeli agents, who manipulate a network of Israeli politicians and army commanders, while Israeli theoreticians explain to various foreign countries how to defeat civil and para-military resistance. All based on the extensive Israeli experience. 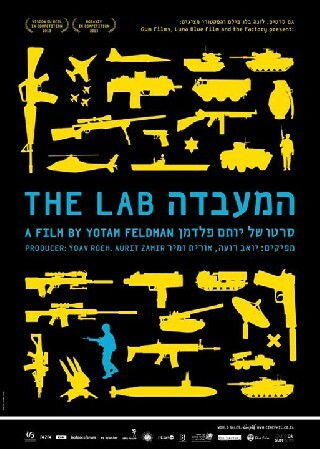 The film reveals The Lab, which has transformed the Israeli military occupation of Gaza and the West Bank from a burden to a marketable, highly profitable, national asset. After the film attorney and activist Eitay Mack, who fights the weapon deals Israel makes with various regimes, will comment and answer questions from the audience. The film screening is part of Securitizing Worlds: a Critical Look at the Israeli Global Security Industry is organized by gate48 (Critical Israelis in the Netherlands) and made possible with the support of the Leonhard-Woltjer Foundation, SECURCIT (European Research Council); NICA (Netherlands Institute for Cultural Analysis), UvA, Stichting Haella and CREA.